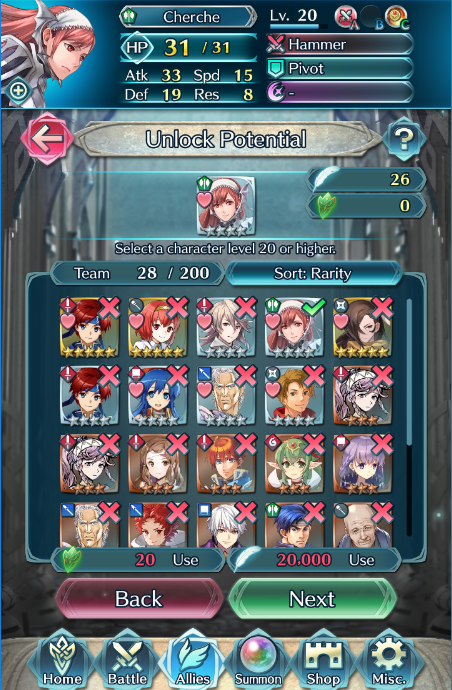 With a lot of time and effort, it is possible to increase a Hero’s rarity (indicated by the number of stars), even all the way to the maximum 5 Star rarity. However, sometimes you may summon a useful or favourite Hero who doesn’t have 4 or 5 Stars–or there is no 5 Star version of that Hero to summon. Which is where the option to increase rarity comes in handy. To do so, you need to navigate to the Allies menu – Advanced Growth – Unlock Potential. From here, you can select a Level 20 (or higher) Hero and consume materials to increase their rarity. Note: Each time a Hero’s rarity increases, they will return to Level 1 with the initial stats for the new rarity. All SP and learned Skills remain though. Badges and Great Badges can be obtained via the Training Tower. These ones aren’t too hard to get. Hero’s Feathers are a bit trickier. 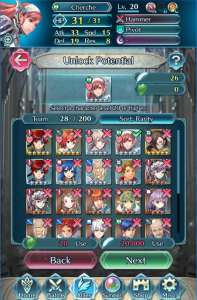 You can get them by performing well in Arena Duels, by sending Heroes home (i.e. discarding them) or by greeting your friends daily (in small numbers). Unless you desperately need Hero’s Feathers (or really dislike a certain Hero), we definitely don’t recommend discarding 5 Star Heroes to get them! But if you have many unloved 3 or 4-Star Heroes gathering dust, you could consider sending them home to retire in peace.